08.12.2009 Small update to fix scroll vertically. 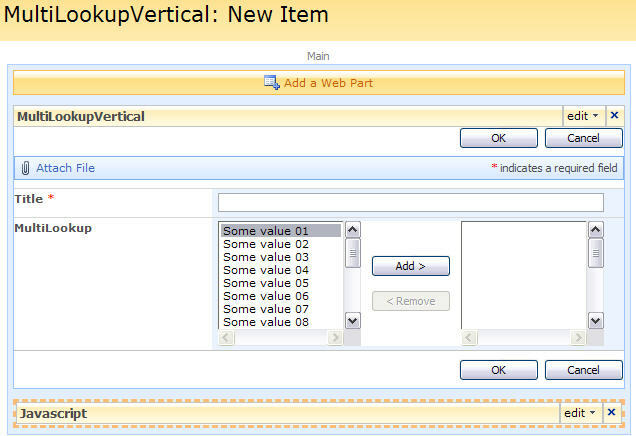 Here’s a tip on how to rearrange the multiple select lookup column in a vertical orientation. Thank you for the post which is exactly what I need. I have inserted the CEWP under the new form.aspx but it does not seem to make any difference. I am pretty sure the src reference is correct and cannot think of anything else..
Do you have any ideas why this might be happening? Hi, Is the NewForm an unmodified form? If so, there must be an error in the script src. can’t get this to work. Get mixed up (its late tonight) with this FieldInternalname. When it is running, the longer texts for choosing should be better readable…..
Would you please so kind to explain what to change additional to changing the path to jquery? Should I put it into an extra (=own) CEWP? Have put in to a cascaded dropdown script (at the end) from another codesharing guy. When combining different scripts you may encounter problems. Try to temporarily remove the other script – or make a “clean” test list. Thank you for the great post. It worked as you have shown. But when I select allow multiple value in child dropdown it did not worked, is there any way I can let users select multiple values??? I’m not quite sure what your problem is? 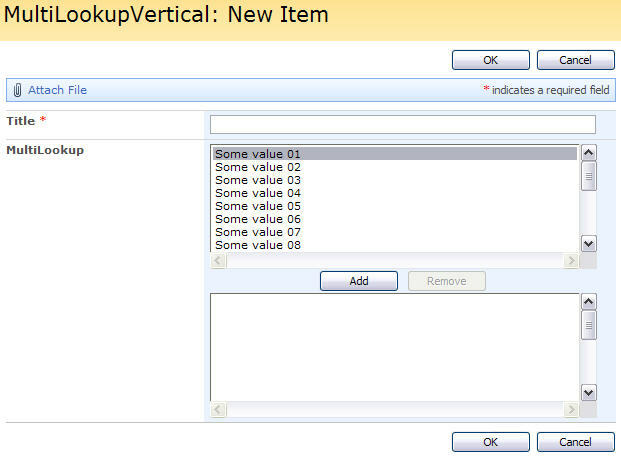 This solution rearranges the “built-in” multi select lookup in SP2007. For 2010 it requires a little fix. you do such great work, any plans to roll out the fix for 2010? Try replacing ‘div’ in line 13 with ‘select’. The code example has been corrupted a bit when I moved the blog to a new server – you will have to change any single quotes as they are formatted wrong. Another thing to note is that the code example is old and may not work in newer browsers or SharePoint versions.